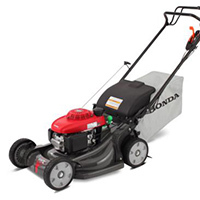 The major difference between this and the HRX217HZU is the inclusion of a key start to get the mower up and running. 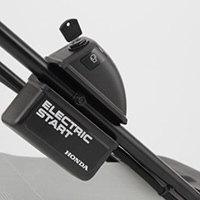 Effortless in operation, the self-charging key start removes the need for “plug-in” charging like other battery-operated or electric mowers. What’s more, the adjustable throttle control allows engine speed to be adjusted to idle when emptying the grass bag or transporting the mower. The blades will stop but the engine keeps going, so when you’re ready to mow again simply disengage the blade brake and away you go! 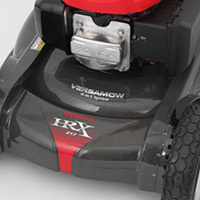 Also featured on the HRX217 is Honda’s exclusive twin blade MicroCut System, which uses four cutting surfaces instead of two. The results are evident in the ultra fine clippings and superior mulching that you’ll get. The HRX217HZU features Honda's revolutionary Versamow System™, which allows you to mulch, bag, discharge, or shred leaves - or even a combination of mulching and bagging! Just slide the convenient Clip Director® knob to choose how much grass is bagged or mulched. 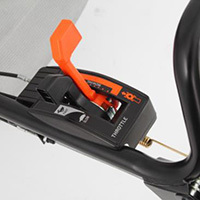 It's the ultimate in convenience and versatility. Want to mulch, but worried about leaving clumps? No problem. The Versamow System™ helps you to mulch or partially mulch even in severe conditions. Just adjust the 10 position Clip Director to the right setting for your lawn. And the Versamow System™ makes leaf shredding easy. Tiny pieces minimize the use of leaf bags for collecting debris. No attachments or tools are necessary. Features an incredibly tough NeXite 21” cutting deck, which is lightweight but tough enough to handle even the most trying of Australian conditions. This high impact-resistant material does not dent, rust or corrode, and the lightweight design means you can easily manoeuvre it around your lawn.